Frank Zappa, 22, Ontario resident and composer of music, serious and otherwise, will be seen on television tomorrow night playing a bicycle concerto for two with Steve Allen. The show is at 11 p.m., Channel 5. "It's very funny," said Zappa. "You play a bicycle by plucking the spokes and blowing through the handle bars." Other methods of producing "cyclophony" is to stroke the spokes with the bow of a bass fiddle, twirl the pedals and let air out of the tires. The Zappa-Allen concerto will be abetted by a man in the control room fooling around with a tape recorder and by a jazz group which will supply toneless background noise. You blow through the handlebars and you can strum the spokes like a harp and you can also bow the spokes and play bass fiddle, there. Meanwhile, I had someone recite poetry. I said 'John, just go ahead and say your favorite poem,' which was Mary Had a Little Lamb . . . obviously. I got Steve Allen to blow it while I worked the spokes, meanwhile I had tinker toy music going in the background, it was quite an extravaganza. I remember this very vividly. After trying to get on the Steve Allen Show week after week as a serious musician, and again mostly with jazz, Frank one day said he was going to take a different approach, and he'd get on that day. He came back that evening, and said "well, I'm going to be on Steve Allen next week." I asked him how he got on. He said, "I just told them I play the bicycle." So he got up there and made noises on the bicycle like it was a percussion instrument, and had Steve Allen blowing on the handlebars, and that's what got him on. And in part, I think that convinced him of the viability of producing the kind of music he ended up producing. 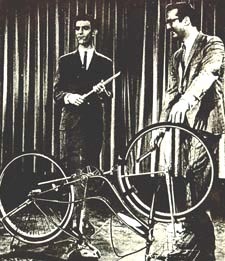 In the early 60's when Frank was on the Steve Allen show, he was showing everyone how the bicycle was a musical instrument and the bike he used was mine!! 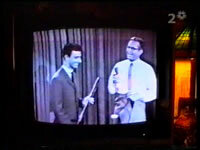 Frank's first television appearance was in the early 60's on the Steve Allen Show. He played a "bicycle concerto". Did anyone see the old Steve Allen show (w/ Zappa)? It was a very young (high school aged) Frank playing a bicycle with the show's band. Frank looked real young and innocent without any facial hair. Does anyone know if the whole clip is available anywhere or know the year it took place? About fifteen minutes or more—from 1963. Zappa seems to start off quite shakily but once he's got in his plug about the movie he's making he relaxes and actually throws back some one liners to the stuff that Steve Allen says. BTW—this is probably the only time I've ever seen FZ not 'in control' of an interview/performance. He seems quite humble compared to Steve Allen, who has a quick witted mind. Did FZ ever meet/appear with Steve Allen again after this? Jerry Hopkins, "Frank Zappa's Bicycle Debut"
It was one of those great moments in music that you don't recognize as such until a long while later. 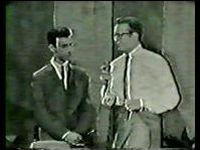 I was working as a talent coordinator for Steve Allen's five-times-a-week, late-night variety show in Hollywood in 1963. My job was to find someone unusual for him to interact with every night. Steve called me his "vice president in charge of left-fielders." Others used the phrase "kook-booker." Some of the acts I introduced were merely unusual, and all Steve had to do was ad lib. Thus, I brought a genuine flea circus out of retirement and on another night an octogenarian pulled three automobiles up the street in front of the television studio with his long, white beard. Other guests were more interactive than reactive for Steve. Someone would "teach" the comedian how to do something, like walk a tight rope, or eat fire, or Steve might get a massage with a vacuum cleaner-like device that was supposed to reduce fat and tone muscles, or get tattooed. The rules for my job were simple. Get someone who was genuinely eccentric or who did something at least a little strange or out-of-the-ordinary, but never make fun of them—the idea was to have fun with them. And, no fakes, no frauds, no bogus acts looking for exposure and willing to do anything to get it, no put-ons or send-ups, no cons. Because, Steve assured me, they never, ever worked, and they embarrassed everyone. Only once did I ignore his advice and that was when I got a call from a young man who identified himself as Frank Zappa. He said he wanted to teach Steve how to "blow bicycle." "Blow bicycle," I repeated. "Yeah, you know, like, the bicycle is a musical instrument." I thought it was a dumb idea, and a bad joke besides, and I felt somewhat uncomfortable about the caller's use of the jive vernacular (knowing that Steve had provided a jazz piano in recordings by Beat Generation poets), but for some reason I asked Frank to come in and a couple of days later he arrived with his old Schwinn. He was wearing a black suit (all three buttons buttoned), a white shirt, and a black knit tie. Still in his early 20s—and years before he became a pop music icon who bridged the gap between classical music and rock—he looked like a small town bank teller trainee. He put his bike on its kick-stand in the lobby of the Hollywood theater where we video taped the show and plucked the spokes as if they were the strings of a harp, pitter-pattered on the seat as if it were Buddy Rich's tom-tom, and, removing the hand-grips, blew across the hollow chrome handle bars, creating the sounds of a wind instrument. He then played a short, improvisational piece and upon its completion, stood waiting for my reaction. I laughed. "You've got to be kidding," I said. "You didn't like it?" he said, seeming genuinely wounded. "I can play another song." We talked. I was sure it was a gag, but I couldn't get him to admit it, and I thought that might be the key to his pulling it off. At that point in his life, he had no album or club date to promote, so I suspected he wanted to appear on the show for the $235 that was paid every "performing" guest. Yet he seemed so damned serious. I also had to admit that what I'd heard was musical. Still, I worried about incurring Steve's wrath, so I told Frank I'd call the next week. Concerned about failure, over the weekend I hatched a plan that I thought might guarantee chaos if not hilarity, and out of the mayhem some laughs. On Monday, I called Frank and asked, "How would you like to conduct a bicycle symphony?" I explained that we'd fill up the television stage with bicycles—two-wheelers like the one he brought in with him for the "audition," tricycles, unicycles, those Victorian ones with the big front wheels, bicycles-built-for-two, everything we could find in the big "property houses" that delivered props to the Hollywood studios. The whole stage would be crowded with bicycles, I said, and Frank could do whatever he wished with them. This was not my introduction to the use of ordinary objects to make music. Like many people coming of age in the 1950s, I saw musical spoons and saws played on television's "Ed Sullivan Show" and I remember someone playing Christmas carols on a table full of champagne glasses by rubbing his fingers around the wet rims. At the same time, a hypnotically new sound was coming out of the Caribbean using hammered (and tuned) steel barrels, or drums. During the folk music boom that followed, musicians put metal thimbles on their fingers and played the corrugated iron surface of a washboard and blew across the open end of a ceramic jug (giving a name to jug bands). Ken Butler made his first instrument in 1978 when he added a fingerboard, tailpiece, tuning pegs and a bridge to a small hatchet. He went on to make music from tennis racquets and other sporting equipment, guns, brooms, and even a toothbrush, a rubber band, a plastic drinking straw. What elevates the music made on such objects above novelty is the fact that when you play the recorded sounds for a human audience—in isolation from any visual stimulus; in other words, the listener doesn't see the music being played—no one would guess that in this instance the musical "axe" really was one. "Weren't all instruments, and, indeed, all inventions, a novelty at first?" Butler asks. It is as if, since our less sophisticated ancestors first started banging rocks together, or maybe hitting tree trunks with sticks in some sort of organized pattern, we've been determined to make music by whatever means available. Music—something that is difficult to define but generally is believed to have melody, rhythm, harmony, and dynamics—was from the beginning and is now a part of every aspect of life, inextricably linked to all human activity—from religious ritual to frothy entertainment—and nothing is too outlandish or impossible. Over the years, while many found music in the ambient environment, others, like Ken Butler and Frank Zappa, deliberately sought the unexpected and much to their and our delight, created new music in the process. Sadly, I don't remember specifically what Frank and Steve did on that long-ago night in that Hollywood television studio, but I do recall that it worked and that afterward Steve suggested I not bring on any more put-ons. He was smiling when he said it. One musician, after all, knows another when he hears one. Thanks to someone named "Robert" who posted the video of FZ's appearance on The Steve Allen Show into the 'alt.binaries.fz' newsgroup, I got to see this wonderful bit of archived entertainment. I saw it when it was originally broadcast and it stuck in my mind even though I knew nothing of Frank Zappa before then, or for a few years afterward, until I got turned on to "Help I'm A Rock" and other absurdities. After that I began buying his record albums in about 1968. 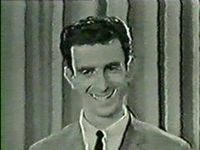 It is odd to see FZ in his clean-cut formative years before he freaked out and became somebody. In the video it seemed that Steverino was more "hip" than FZ although Frank rolled with the flow quite well and was not in any way intimidated by what was one of the biggest television celebrities of the era. It was also odd to hear Allen pronounce Frank's surname as "ZAH-pa" instead of the way we all say it, ZAP-pa. I say "In praise of Steve Allen" although that is an overstatement. Television in that day was so much more innocent than today's tightly scripted and market-researched crap. "In Praise of Steve Allen and Television of the Early 1960s" might be more apppropriate. I don't recall how long each episode of The Steve Allen Show ran, but, I'd surmise 90-minutes (I could research it but I haven't) instead of 60 minutes as is popular these days. I despise late night chat/variety shows these days because whenever there is a musical guest on them, unless a certified superstar individual or group, they are relegated to less than five minutes at the very end of the show. At that, quite often, a singular musician or stand-out member of the group MAY get to sit by the host's desk for an all too quick new-album plug. "In Praise of Steve Allen and Television of the Early 1960s"....thanks to television programming of nearly four decades ago, and Steve Allen for actually being hip back then, to allow a full 20 minutes of air-time to some nearly indescribable individal with a taste for the bizarre to do his thing. Without that venue, without the innocence of television of the era, without the open-mindedness of a hip tv host in his prime, that early Frank Zappa television appearance would have never been broadcast. By the way, what's the difference between "Louie Bellson drumsticks" and ordinary ones. They looked to be a bit fatter to me. Is that it? And why? Just more comfortable to play with by certain individuals?